If you are wondering around Trevi Fountain and the Sistina Theatre and fancy eating in a (real) roman restaurant you should definitely pay a visit to the Enosteria Capolecase. 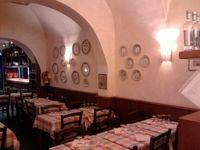 As you can imagine the restaurant is situated in a very central position and it offers typical roman cuisine at a very fair price. The speciality of the cucina romana is, of course, pasta! It is not easy to cope with the standards of Roman cuisine but I must admit this restaurant has definitely passed the test. After antipasti of melon, hand sliced raw ham (prosciutto crudo) and fried vegetables (tempura) we tried the speciality of the restaurant – Matricianella. Matricianella is a kind of pasta served in a sauce made of fresh tomatoes and Lardo di Colonnata (special fat from the pigs of Colonnata) instead of the ordinary guanciale (cheek of pork) used in the original recipe, with a sprinkling of pecorino cheese on the top. If this is your first time in Rome you have to try it! The restaurant has also a nice selection of Italian wines: however we didn’t want to spoil the Roman atmosphere by ordering a bottle of wine from Tuscany or another Italian regions so we asked for a nice bottle of Satrico (Casale del Giglio). We then opted for a fillet of beef cooked in a creamy red wine sauce (chianti) and a tagliatawith balsamic vinegar. After all we had eaten (the portions are plentiful) we even managed to try the dolci. I had a fantastic chocolate cake filled with warm chocolate cream – delicious. Diners can get antipasti, pasta, fillet, cake and coffee for €40. In this economy, that’s definitely a deal worth checking out. The restaurant is also very popular with business people who drop by at lunch time. In this case I would recommend ordering a plate of pasta (Matricianella of course) and the chocolate cake, in which case you wouldn’t spend more than €15.